Approximately two to three 45-minute class sessions are needed for discussion of concepts and explanation of the assignment. Research Begin this lesson by assembling information about the events portrayed in the paintings: the desegregation of public schools in New Orleans in 1960. The presentation of this information can take many forms, but independent inquiry will yield the sort of divergent accounts of the event that make the lesson interesting. In small groups, have the students research the events, compiling the information into brief written explanations of the historical “facts.” This quick research should provide sufficient contextual information for analyzing the images. Have each group share their account of the historical event, highlighting and discussing discrepancies or differences in the information the students found. Does this painting match what you know about the event? Do you think this painting is trying to accurately represent the event, or simply alluding to it? What sort of “true” information is included? What is left out? What, if anything, makes the painting realistic? What, if anything, appears to be manipulated? What are important details in Rockwell’s particular representation of the event? Why do these things stand out? What is Rockwell trying to emphasize? Is Rockwell representing or interpreting the event? What is the difference? Do you think this image is a valuable source of information about the event? Why or why not? Share and debate the results of these discussions. As much as possible, draw attention to the paradox of “representing” an historical event. Try to help the class identify Rockwell’s interpretation of the event as implicit in his representation. Ask the class what makes one source of visual information more accurate than another. For example: How would looking at a photograph of this event be different? Why do we consider a photograph more historically accurate than a painting? Do you think these video clips accurately represent the historical event? What details do they show? What details are left out? Is there any bias in the presentation of the event? Why might the creators of the film represent the event in this manner? Does this film present fact or interpretation of the event? Defend your response. How does the video clip differ from the Rockwell image? Is it in any way similar? How might you interpret the Rockwell image differently now that you have seen this video? Is any one visual medium more reliable than another as a source of historical information? How are these different forms incomplete? Analysis To assess understanding, have the students select one of the Rockwell images and critique it as a source of information in essay form. As part of the assignment, students should analyze the focus and composition of Rockwell’s image, identify its strengths and weaknesses as a representation of the event, and suggest how his creative decision making influences the viewer’s understanding. 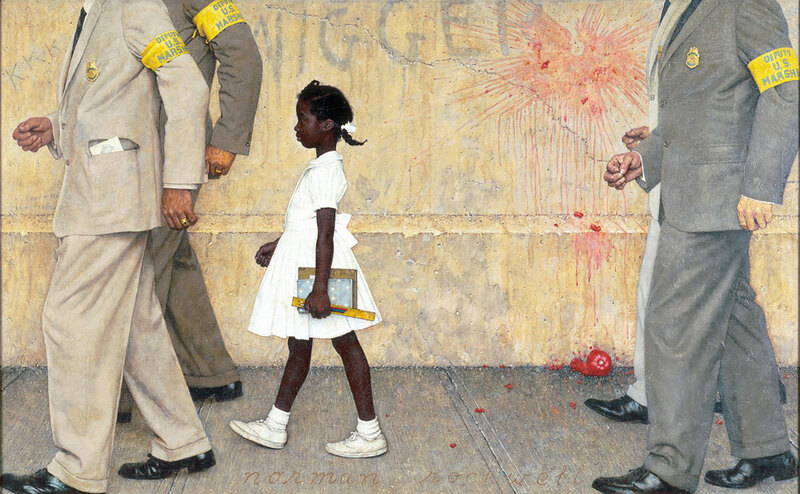 Analysis of Rockwell’s images could serve as a powerful starting point for a research project on the Civil Rights movement that emphasizes visual information. For instance, another Rockwell image that deals with the Civil Rights movement is Murder in Mississippi. This image focuses on the murders of Michael Schwerner, James Chaney, and Andrew Goodman, three civil rights workers who campaigned for equitable voter education in Mississippi. Suggested supplementary materials for a lesson plan based on this image include from the Eyes on the Prize (1986) videotapes series, Vol. 2 (Fighting Back) and Vol. 5 (Mississippi: Is This America?) and http://www.watson.org/~lisa/blackhistory/civilrights-55-65/missippi.html . Have students prepare a documentary presentation, giving attention to diversity of sources and media, accuracy of information, and analysis of the persuasiveness of materials. How will this event be “re”presented? Consider a screening of Mississippi Burning, directed by Alan Parker (1988), which represents the same event portrayed in Rockwell’s painting. Although Parker’s film is suited only for older students (as it is rated R), seeing this film would allow your class to extend their inquiry of historical representation into another medium. Students could research, investigate, and discuss other artists who represent events in the Civil Rights Movement, relating their comments to Rockwell’s technique. Examples of artists who have dealt with the Civil Rights Movement include Carrie Mae Weems, Roy De Caravara, Spike Lee, and Alfredo Jaar (whos work can be found in the High Museum of Art’s permanent collection). How do these representations inform or influence our understanding of the event? How do they contrast with Rockwell’s vision of the time period?